After a visit by the equal opportunity employment commission, Greenhouse Fabrics realizes that, while it does not discriminate against bears or ursine anywhere, its current hiring practices may not reflect that. 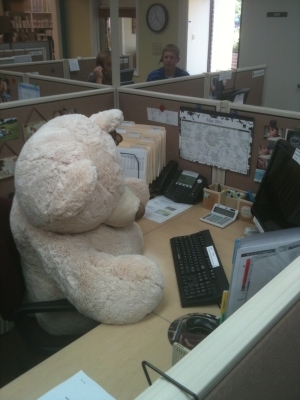 With this in mind we set out to hire the most qualified bear we could find for a new position in our customer service center. We think you will be as happy as we are with our new hire! ps. Sorry there isn't a bigger point to this. Sometimes you just end up with a 6 foot tall stuffed bear in your office on a Monday and you need to share the experience.